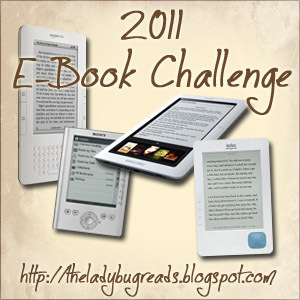 This challenge is now being hosted by La Coccinelle at The Ladybug Reads. (was previously hosted by Alaine at Queen of Happy Endings). ►Curious – Read 3 eBooks. ►Fascinated – Read 6 eBooks. ►Addicted – Read 12 eBooks. ►Obsessed – Read 20 eBooks. 6. Go to The Ladybug Reads’ blog to sign up. I'm going for Obsessed...even with a baby coming in April 2011, I really think I'll be able to read 20 eBooks because eBooks are basically all I read any more! Thanks for joining! This is going to be a fun challenge.